Present state: The platform has been demolished leaving only a slightly raised area of ground. An access road to a school car park runs across the site of the platform. The large concrete forecourt is still extant and used for residential parking. disappeared and trains haven't stopped here since the mid seventies. A wartime shelter and some footings are all that remain. On 20.9.1954 Greatstone-on-Sea lost its staff and was downgraded to a halt. The platform was demolished some time after 1983.
were prominentin the SER. The line had 12 level crossings in its 8 mile length. 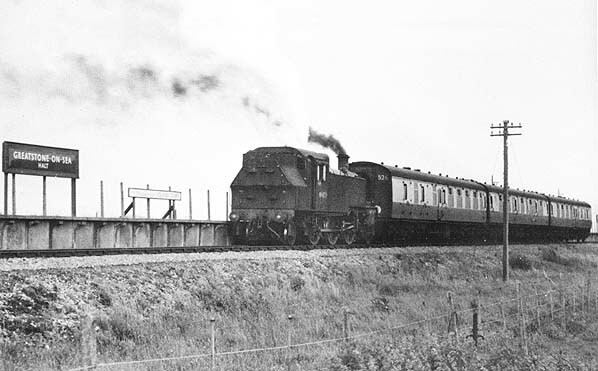 The New Romney line opened on 19 June 1884 and some unusual workings were introduced with two branches being worked by one locomotive requiring some trains serving Dungeness to reverse back to Lydd Town before proceeding on to New Romney. This procedure was greatly simplified when push-pull trains were introduced. In 1895 the local company was absorbed into the South Eastern Railway. With the Dungeness port scheme abandoned, the SER obtained powers in 1900 to extend their line to Hythe but this was never built. Kitson steam railcars were introduced onto the line in 1906/7 and with the development of military ranges and a large army camp at Lydd, the line was well used until the end of WW1. Passenger numbers were now in decline although agricultural freight, including Romney Marsh sheep remained profitable. By the 1920's New Romney was served by 9 trains a day while Dungeness was relegated to 3.
opened on 4 July 1937. 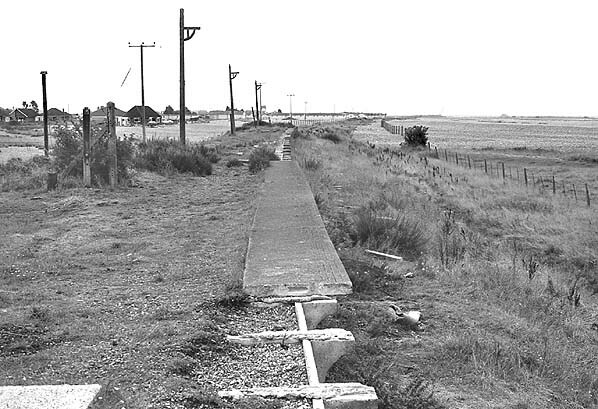 At the same time the station at Lydd was renamed Lydd Town and passenger services to Dungeness was withdrawn, although the freight service was retained. The line remained open with a reduced service during WW2 although an obvious target for enemy aircraft. A heavily armoured train was allocated to Ashford - Hastings - New Romney group of lines with regular patrols being undertaken. 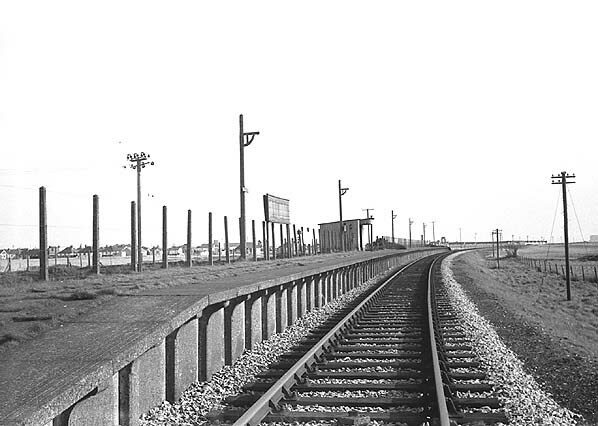 Nationalisation in 1948 initially brought few changes but with competition from busses and the popularity of the motor car in the 1950's traffic continued to decline and economies were inevitable including the withdrawal of the Dungeness freight service in 1952 and the removal of the passing loop at Lydd-on-Sea. branch were proposed for closure in the 1963 Beeching Report. The goods services to New Romney was withdrawn in 1964 but the threat of closure was suspended until 1966 when the Minister of Transport announced that the passenger service on the New Romney branch would cease on 6th March 1967. The Ashford - Hastings line was however reprieved although some sections were eventually singled. 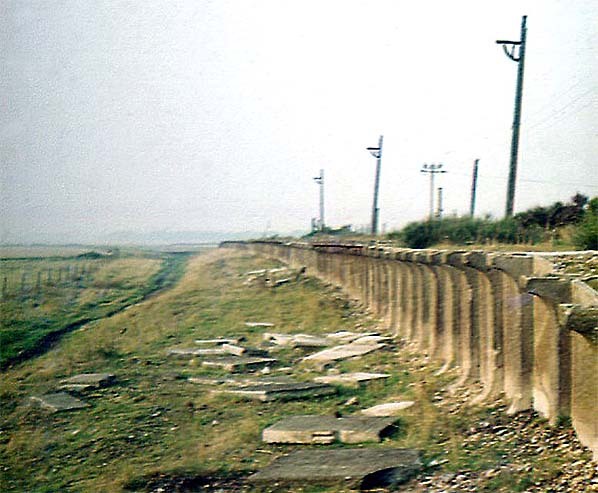 Goods services to Lydd continued until 1971 and the line was still in use for the removal of ballast aggregates and waste from Dungeness B nuclear power station. All track beyond Romney Junction has been lifted. The only passenger movements since closure have been occasional troop trains and railtours, the most recent being the Lydd Ranger Railtour on 13th March 2005.